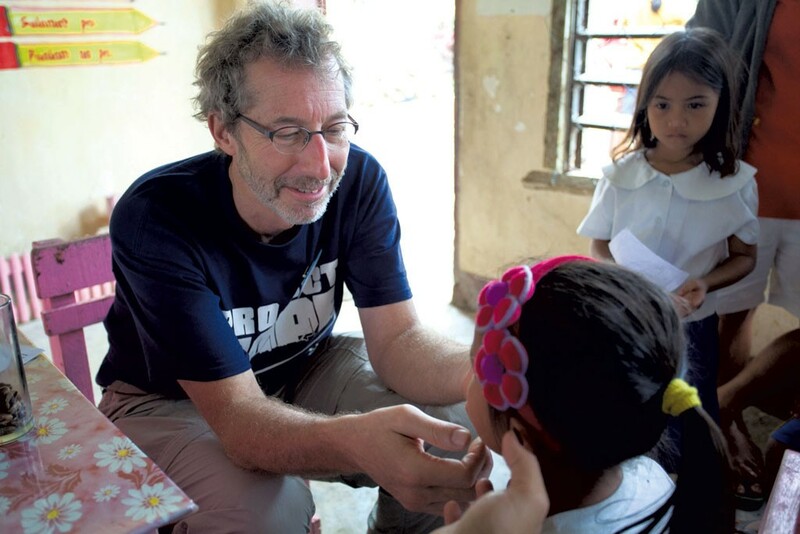 When pediatrician Barry Finette treated sick kids in some of the world's poorest countries, he knew his patients had already defied incredible odds: They were seeing a physician. That's something most children in the developing world never experience. The low- and middle-income countries in Africa, Asia and South America where Finette worked for years with international aid organizations have a severe shortage of medical professionals. On average, he says, there's just one doctor for every 20,000 to 100,000 people, and one nurse for every 2,000 to 10,000 people. As for the availability of pediatricians like Finette, who's a professor of pediatrics, microbiology and molecular genetics at the University of Vermont College of Medicine, "they're virtually nonexistent," he says. As a consequence, an estimated 6.6 million children under the age of 5 die worldwide each year — a rate of about seven kids per minute. More than half of those deaths are due to conditions such as pneumonia, dehydration and fever-inducing diseases like malaria, which would be completely treatable if the kids had access to basic medical interventions. In 2013, Finette — the director of UVM's Global Health and Humanitarian Opportunity Program and the father of seven himself — put his mind to improving those kids' chances of survival. He knew the world holds nowhere near enough pediatricians to tackle the problem face-to-face. So his solution was to create a mobile app that replicates what a board-certified pediatrician would do to treat a child in life-threatening circumstances. MEDSINC, short for Medical Evaluation and Diagnostic System for Infants, Newborns and Children, is a "medical intelligence platform" downloadable onto any mobile device. It provides users who have little or no medical training with a list of questions to ask when assessing a sick child. The app then determines the severity of the child's condition and recommends treatment options based on the skill set of the user, as well as on the equipment and supplies available at the user's location. For instance, the app might ask a community health worker who encounters a child with symptoms of respiratory distress questions such as "How fast is the patient breathing?" "Is the patient coughing, and if so, for how long?" "Is the patient crying?" "Without or with tears?" Based on the responses, the app will then recommend the most important therapy to provide — even if the health worker doesn't know, or can't determine, the condition's underlying cause. The development of MEDSINC is the result of a unique collaboration among Vermont's medical professionals, software designers and tech entrepreneurs — who have also founded a new benefit corporation called THINKmd to deploy the product rapidly overseas. Those involved in the project predict that MEDSINC will eventually save lives not just in the developing world but also in the United States and other industrialized countries. Charles MacCormack, former president and CEO of Save the Children, an international aid organization with a presence in 126 countries, says the implications of this technology are "huge" for improving the health of children worldwide. "For the bottom billions in the Congos and Chads of the world, it's going to be a long, long time before trained pediatricians, or even pediatric nurses, are going to be available," says MacCormack, who's now an executive-in-residence in international development and global health at Middlebury College. "So if people are going to get any health support at all, it'll have to be delivered in other ways." MEDSINC began in 2013, when Finette first brought the idea to his colleague Barry Heath, director of inpatient and critical care at the University of Vermont Children's Hospital. Finette and Heath knew that together they could come up with criteria for assessing a child in medical distress. What they lacked were the skills to develop the app's algorithms and software, as well as the entrepreneurial know-how to launch a tech startup to bring the product to market. That's where John Rosenblum came in. Rosenblum is a business and technology consultant and entrepreneur who lives in Calais. In 1998, he cofounded Green Mountain Logic, a medical and health-science software company based in Montpelier. In 2007, Green Mountain Logic was acquired by Phase Forward, which was itself later acquired by tech giant Oracle. Back in the 1980s, Rosenblum was part of an effort to create what was then called a "doctor in a box," or an artificial intelligence that could assist in medical decision making. That effort failed, largely because it required computing power that was still decades in the future, but Rosenblum now says he always believed the technology would "have its day." So when Finette approached Rosenblum with his idea, he found a receptive audience. The tech entrepreneur remembers his initial response to Finette: "It sounds like a great idea, but I can't believe no one has done it yet." In fact, no one had. Finette had already done his homework, speaking to representatives from nongovernmental organizations such as Save the Children, UNICEF and the Bill & Melinda Gates Foundation. None of those NGOs knew of any such technology in the works, though all expressed a strong interest in using it. "This is a really interesting technology to me, too," Rosenblum says. "And the fact that Barry is primarily interested in preventing three and a half million kids from dying each year is a really altruistic goal that excites me." So Rosenblum introduced Finette and Heath to John Canning, cofounder and president of Physician's Computer Company of Winooski, which builds software systems to help doctors manage their medical practices. Canning was so impressed by the concept that he agreed to donate his time and resources to build a prototype. Finette and Heath immediately got to work, focusing on one of the world's biggest killers of children under age 5: pneumonia. As Finette explains, there's no single diagnostic test for the lung infection. Instead, a doctor reviews a spectrum of information that includes the patient's medical history and a physical exam, then deduces what's happening and recommends an appropriate course of treatment. Finette points out that it's not essential to diagnose the child conclusively with pneumonia, or to pinpoint the underlying condition causing it. What's critical, he says, is to determine the severity of the child's respiratory distress and address it promptly. The same, he says, holds true for other major killers of young children worldwide, including dehydration (typically caused by severe diarrhea), sepsis and malnutrition. All four conditions were eventually incorporated into MEDSINC's evaluative process. Finette and Heath assembled a team of 10 university-based pediatricians to determine which questions the app should ask. Most are based on standardized protocols from the World Health Organization or the latest evidence-based research. Within a year, Canning had built a web-based MEDSINC prototype, which was completed in July 2014. Testing began the following month, using actual pediatric patients in UVM Medical Center's emergency department, pediatric ward or offices, and is ongoing. Heath emphasizes that such testing is performed with the full consent of patients' parents or guardians and is not used to recommend treatments. It's simply a way to measure how closely the app's "advice" conforms with that of a board-certified pediatrician. How well has MEDSINC performed thus far? According to Heath, those conducting the tests include medical and nursing students with very limited skills in assessing sick children. Nevertheless, when they answer the questions MEDSINC provides them, the app's recommendations have corresponded to those of actual pediatricians 94 percent of the time. "If you have two board-certified pediatricians examine the same patient, they only agree about 80 percent of the time," Heath points out. "We wanted our algorithm to be at least 80 percent accurate, so it would be like having a pediatrician in the room. Right now, we're exceeding that." The app will be deployed in the field later this year — probably initially in Bangladesh, Finette says. In those trials, local on-site practitioners will enter data beforehand that tells the app which medical resources are available in a particular clinic or hospital. So if a child comes in with, say, severe hypovolemia (decreased blood volume), the device will know whether the health care worker has intravenous therapies available and knows how to provide them. If not, Heath says, MEDSINC will recommend a different therapy. Later versions of MEDSINC will allow health care workers in the field to plug noninvasive monitoring tools directly into the mobile device to gather such biometric information as oxygen saturation, hemoglobin and blood sugar levels. If those workers don't know how to, say, measure skin turgor — an assessment of the skin's elasticity, which is used to gauge dehydration — MEDSINC will provide photos and videos to guide them. As Finette puts it, "It's actually a self-training tool." Once MEDSINC's recommendations have been shown to be valid, consistent and reliable in the field, Finette says he plans to complete a second iteration focusing on newborns, who also suffer high rates of mortality in developing countries. Future versions of the app, he says, can be tailored to treating older kids, then adults. With companies such as Mozilla now selling smartphones overseas for as little as $25, Finette says the potential for getting the product into developing countries at a very low cost is enormous. But the team won't necessarily limit its market to such needy regions, expecting that the app could eventually be sold in industrialized countries for use by emergency responders, for triage in emergency rooms and physicians' offices, even for patients to self-evaluate at home before calling their doctor. Will MEDSINC require approval from the Food and Drug Administration before it can be sold in the United States? "That's a really good question," Finette admits. "You have to ask the FDA. They don't know yet." One advantage of deploying early versions of the app in low- and middle-income countries, as Rosenblum points out, is that the regulatory hurdles there are much lower than those in the U.S. Currently, both UNICEF and Save the Children have expressed a willingness to try MEDSINC in the field. The data those organizations gather, Rosenblum says, will be vital when it's time to seek regulatory approval elsewhere. For his part, Finette acknowledges that the idea of eventually licensing MEDSINC in industrialized countries and turning a profit is good for the sustainability of THINKmd. But his primary motivation, he says, is to save the lives of children who die for no other reason than the circumstance of where they were born. "There's an enormous need out there right now," he says. "In general, kids less than 5 rarely die from not being able to get clinically assessed and treated early in the U.S."
The original print version of this article was headlined "Pocket Pediatrics"